But, no matter how many great articles you’ve read online or how many communication courses you’ve taken, it doesn’t get easier. You probably know someone, who’s like a “conversational-ninja.” People who effortlessly handle every difficult conversation like it was nothing. What’s their secret? What do they know that you don’t? Let’s say you wanted to lose weight. What could you do? All those things are just tactics. And tactics are not the real problem. The truth is, we’ve never had more knowledge about how to lose weight than we do now. So then, why is obesity a bigger problem than ever? The secret to weight loss and how to handle difficult conversations is exactly the same. It’s all about controlling your psychology. You can worry about the tactics later. Now, I’m not saying tactics aren’t important because they are. But those tactics are useless if you don’t handle your psychology first. Today, I’ll show you how to overcome any difficult conversation by controlling your psychology. I’ll also give you some specific tactics you can use. Let me give you a few examples of why psychology always comes first in difficult conversations. The most difficult thing in those examples is not figuring out what specific words to say… it’s not about finding the perfect time and place… 90% of the time the #1 thing holding you back from taking action in any difficult conversation is your own emotions. If the real problem is handling your own emotions, how do you consciously control them? IBM lost $10 million because of a decision made by one of its VP’s. He was called to the office to speak to IBM’s CEO, at the time, Tom Watson Jr.
Of course, losing $10 million is not something you plan for. The real lesson here is, that in ANY situation, you can always decide to look for the silver lining. The situation is what it is. But, you can ALWAYS change the meaning you give it. And the way you do it is by asking yourself some great questions. Obviously, the questions you ask depends on the situation, and the type of difficult conversation you need to handle. But, in general, there are some questions that will work 90% of the time. So, you control the emotional part of the conversation, by asking yourself some great questions beforehand. This is, by far, the most important aspect. Let’s look at how you make sure that your next difficult conversation goes as smoothly as possible. Basically, we don’t want to do too much work, if we don’t have to. Our brain just can’t handle too much information at once (sorry to all of you self-proclaimed “multitaskers”). You focus on ONE thing. Don’t give them vague generalities like, “just do better next time.” Instead, give them one specific, tangible, and actionable thing they can do. Make it dead-simple for people to have success. Life is hard enough already. Next, let’s look at how you’ll always be prepared for any difficult conversation in the future. No matter what the situation, 80% of the hard work, always happens upfront. The same is true with difficult conversations. You do the hard work upfront. You test different questions. You see the kind of response you get. And you save the best ones in your Questions Vault. At this point, you need to control the temptation to make things fancy. Focus on making it simple, easy to remember and quick to get a hold of. Control your own emotions by reframing the problem to make the conversation 10x easier. Look at the problem from different angles. Show the other person you actually care about how they feel. Ask yourself some great questions to get your emotions under control. It doesn’t need to be more difficult than it already is to handle difficult conversations. 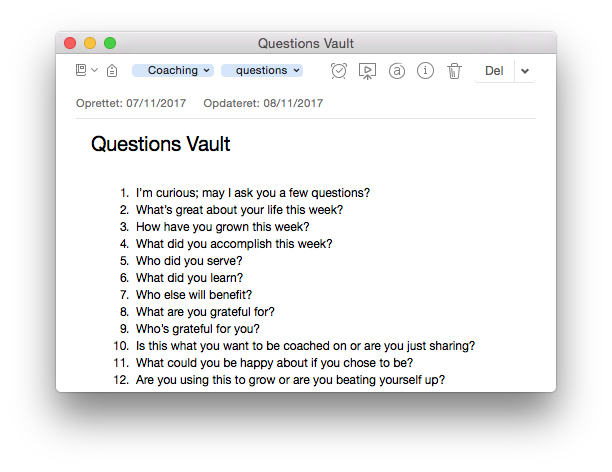 Test out your different questions from your Questions Vault, and see how the situation changes. You’ll be surprised how a subtle shift in focus can change everything. I challenge you to test your questions out today! They always take action as fast as possible. Test out some different questions and let me know how it goes in the comments. I would love to hear about your success.